Oh, this is definitely my kind of garden! The annual Royal Horticultural Society (RHS) Chelsea Flower Show is currently taking place and this year, I’d say, it’s more gorgeous than ever. If you’ve not visited before, as always, it is in the grounds of the Royal Hospital Chelsea in London, SW3. It was first held in 1913 and it is the world’s premier exposition for flower and landscape gardens, attracting visitors from the world over. In this year’s edition, LG’s Eco-City Garden is one of ten show gardens filling the Main Avenue and we can now confirm that this garden has been presented with the Show’s Silver Gilt medal for it’s ‘unique and innovative approach of integrating technology and nature to address today’s urban environmental issues’. LG Electronics and Korean landscape architect, Hwang Hay-joung collaborated at the Chelsea Flower Show, with LG Eco-City Garden featuring a variety of innovative, environmentally-friendly technologies alongside today’s state-of-the-art appliances. LG Eco-City Garden shows how consumers’ increased dependency on technology can coexist with the environmental issues posed by contemporary lifestyles, as well as help reduce pollution in areas of high population density. 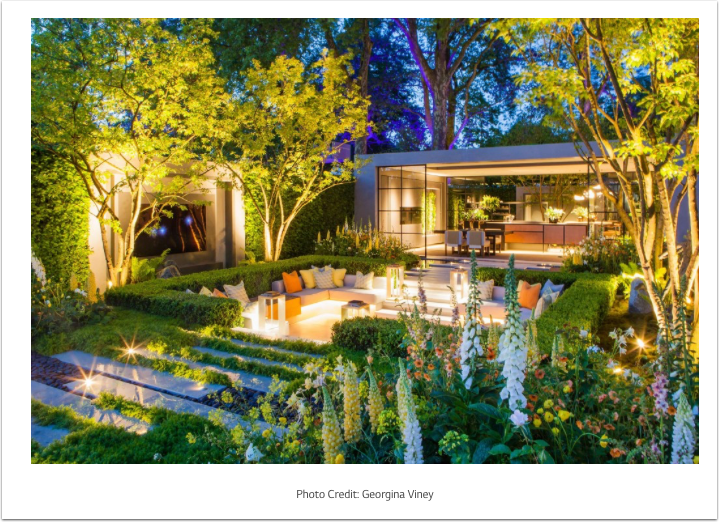 This is LG’s second project collaboration with Hwang, the first being LG Smart Garden at the 2016 Chelsea Flower Show, also a Silver Gilt medal winner. This year, Hwang integrated LG’s Internet of Things (IoT) technology with a model of a modern apartment to demonstrate sustainable urban living. For example, Hwang incorporated LG’s intelligent air purifier system controlled by the SmartThinQ app on the G7 ThinQ smartphone into her design. LG Smart Garden highlights self-sufficiency and efficiency through the use of renewable energy in the form of solar panels that power LED lighting to produce the perfect conditions for plants to grow. The home is designed with its own spacious terraces, accessed from the kitchen and designed to receive plenty of sunlight. Plants and trees not only soften the visual impact, they play a role in controlling the indoor climate and filtering the air, while running water helps modulate noise pollution. The showcase demonstrates closer interaction between concrete, glass and the greener environment. The naturalistic planting scheme shows how to incorporate wildflowers, perennials and a looser meadow-style planting into a garden. The aquaponic urban farm system nourishes a vertical vegetable and herb farm with nutrients generated from fish waste.